Fiesta dinnerware sets can be found in individual colors, but it is also available in open stock dinnerware, which is perfect for collectors or those who like to mix and match the patterns. The Fiesta brand was introduced in 1936 by The Homer Laughlin China Company. Originally, the dinnerware was produced in primary colors including red, cobalt blue, light green, and yellow. Old ivory was also included in 1936 line. Since then, various colors have been steadily introduced to form an array of colors of Fiesta dinnerware. Due to the popularity of the Fiesta line, many competitors began to produce similar dishes and called them fiestaware dishes. If you are into collecting original Fiesta dinnerware, I suggest that you get familiar with the backstamps so that you be certain that what you are getting is real, and not a knockoff. You can get this information through a collector's guide . Fiesta tableware can be found in dinnerware sets , place settings, or individual pieces . This is advantageous because some collectors collect individual pieces and mix and match the collectible dinnerware. For instance, a collector might just want Fiesta plates in a certain color, rather than a whole set. The latest addition of colors include Flamingo (introduced in 2012) and Lapis (introduced in 2013). 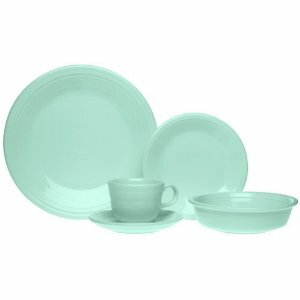 To learn about the colors and released, visit my main page about Fiesta Dinnerware. While I would like to a have of one color, I'm particularly impressed by mix and match collections. I have seen some collector's display individual pieces, like the pitcher, in all of the colors that have been introduced over the years. Some try to get all of the pieces in each color and some just mix and match a few colors. Any way it comes, I haven't seen a Fiesta collection that I didn't absolutely love. I was rather surprised when we went to a restaurant in Roswell, New Mexico and they were using Fiesta dinnerware in the restaurant. It was a rather homey cafe and the dinnerware looked spectacular.